Magnificent villa of 500 m2 built located in the upper part of the residential area of ​​Cas Català. Its privileged location gives us, from any corner, spectacular views of the entire Bay of Palma. The house is distributed over three floors, which are accessed from the main entrance, in a very quiet and safe street, with parking facility. In the interior, through a spacious hall we access a large and bright living room with large windows that offer stunning views of the sea from any angle. A pleasure for the eyes of its visitors, both when eating and reading a book, or just relax with a drink or a quiet chat. On the main floor, there is a toilet, and a large covered terrace to enjoy meals and dinners outdoors, the garden and the pool are illuminated creating a very cozy atmosphere and during the summer months it is very pleasant to eat outside . On the opposite side of the main floor is a large fully equipped kitchen with utility room, there are stairs that allow us to go down to the garden where we can comfortably transport food and drinks to the large barbecue or the pool. From the main living room, stairs lead to the upper floor where there is another large living room with comfortable armchairs where you can relax, an office and another terrace with views. On the lower floor, which is accessed from another staircase, there is the bedroom area, in total six double bedrooms, which combine double, single and children's beds. There are four complete bathrooms, some distributed in suite, and others shared. From this floor you can access the exterior, which leads to a large pool with a size of 9x5 and a depth of 2m. The pool is framed by Mediterranean vegetation and in the background we see the Bugambillia Beach. We can access from the pool to another outside toilet without having to enter the interior of the house, an outdoor shower next to the pool, a garden table with chairs, and numerous sunbeds, which complement this leisure area. Outside, at the side of the pool there is a large covered barbecue for cooking and preparing cocktails, which also has a wood-burning oven. It also has a ping-pong table. The house has heating, air conditioning on the main floor, fireplace and WiFi connection. 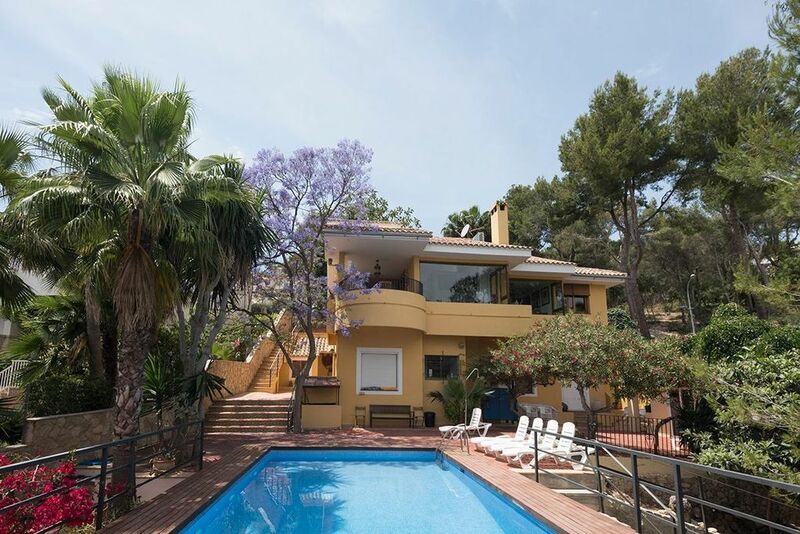 The villa is located in the urbanization of Cas Català, a quiet and safe residential area, and very well connected, five minutes from downtown Palma. The property allows you to walk to the beaches of Cala Major, Bugambillia, and Illetas. It is also possible to visit the gardens of the Marivent Palace, the Joan Miró Foundation, the Bellver Castle as cultural leisure, 5 minutes from the house. The nearest beaches are Cala Mayor, Bugambilia and Illetas. The area of ​​Cala Mayor also has numerous restaurants, beach clubs and beach bars, as well as supermarkets and clothing stores. We also have the Benditat golf course for lovers of this sport and the sporting purto of Cala Nova for those who wish to rent a boat or water sports such as wake, water skiing or surfing (our collaborators can offer all these services) Ten minutes by car you can visit the Portals Marina, one of the most prestigious marinas and leisure centers on the island, or the Puerto Adriano or fifteen minutes by car, one of the most modern ports in the Mediterranean and with moorings for large yachts, restaurants and shops in an exclusive commercial area. The Bendinat golf course is just 5 minutes away by car. The house is very close to commercial areas, such as the main shopping center of Palma, Porto Pi Centro. Five minutes from the famous Paseo Marítimo to take walks, go by bicycle, or enjoy its restaurants and nightclubs. It is located 17 km from the airport, and with easy access from the beltway.